Today, Sonya Chowdhury, CEO, Action for M.E., has released an Open Letter to Dr Ra’ad Shakir, Chair, ICD-11 Revision Topic Advisory Group for Neurology. The Open Letter has been copied to Tarun Dua, Managing Editor, Neurology Topic Advisory Group, WHO; Christopher Chute, Chair, ICD Revision Steering Group, WHO; Dr Geoffrey Reed, Senior Project Officer, International Advisory Group for the Revision of ICD-10 Mental and Behavioural Disorders, ICD-11, WHO; Dr Margaret Chan, Director General, WHO; Dr Robert Jakob, MD, Medical Adviser, WHO. In the interests of transparency, I have acted in an advisory capacity in the preparation of this joint letter in respect of existing ICD-10 coding, proposals for the G93.3 terms for ICD-11, as they had stood in January 2013, and around Beta drafting platform technicalities. Chief Executive Sonya Chowdhury has written an open letter to Dr Ra’ad Shakir, Chair of the World Health Organisation neurology topic advisory group, regarding concerns over the classification of M.E./CFS in the WHO ICD-11. There has been concern within the M.E. 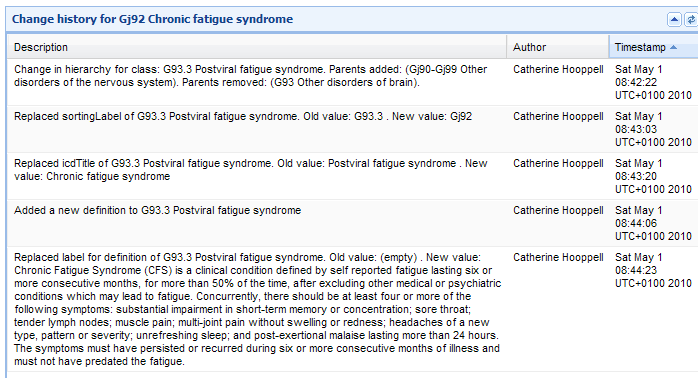 community that the three ICD-10 G93.3 terms, PVFS (Postviral Fatigue Syndrome), BME (Benign Myalgic Encephalomyelitis) and CFS (Chronic Fatigue Syndrome) have been missing from the public version of ICD-11 Beta draft since early 2013. The letter which has been produced collectively, is also signed by Annette Brooke MP, Chair of the All Party Parliamentary Group on M.E., the Countess of Mar, Chair of the House of Lords-led group Forward ME, and Dr Charles Shepherd, Medical Adviser of the ME Association who, like Sonya, is a member of the APPG secretariat. We are writing, collectively, on behalf of the estimated 250,000 people with M.E./CFS. in the UK. 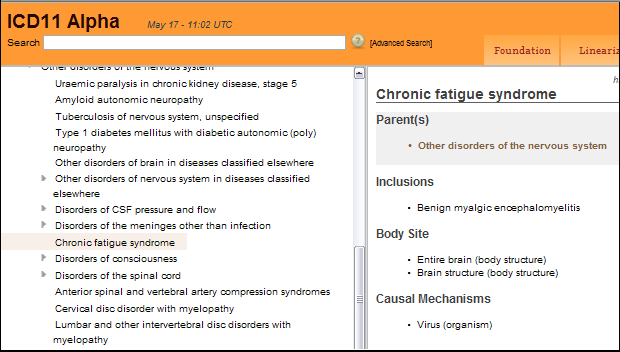 As you may be aware, there has been considerable discussion and concern expressed within the M.E./CFS community regarding the WHO ICD-11 classification. As both individuals and organisations, we have received a number of questions and concerns from people affected by M.E./CFS and are therefore writing to seek clarification to enable us to respond accordingly. We are keen to work collaboratively with others to help empower and support people affected by M.E. and as such, would be very happy to discuss this further with you directly or welcome you to a meeting of either the All Party Parliamentary Group on M.E. or Forward M.E. (a House of Lords-led collaboration). 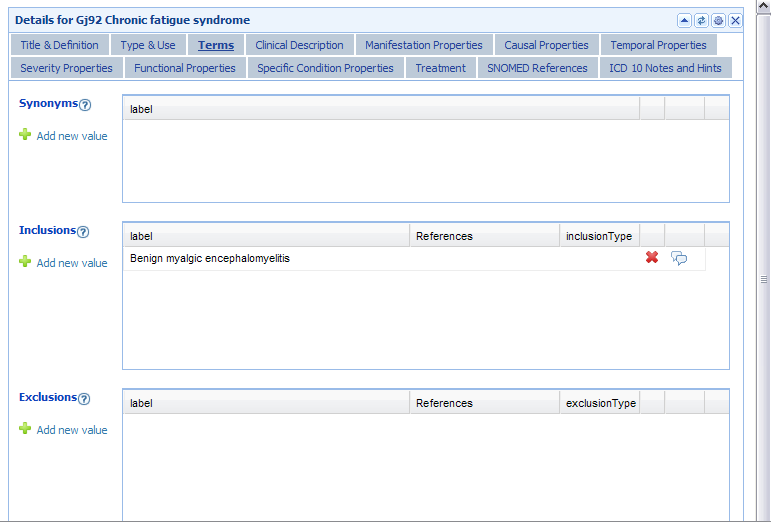 The three ICD-10 G93.3 terms, PVFS (Postviral fatigue syndrome), BME (Benign myalgic encephalomyelitis) and CFS (Chronic fatigue syndrome) have been missing from the public version of ICD-11 Beta draft since early 2013. 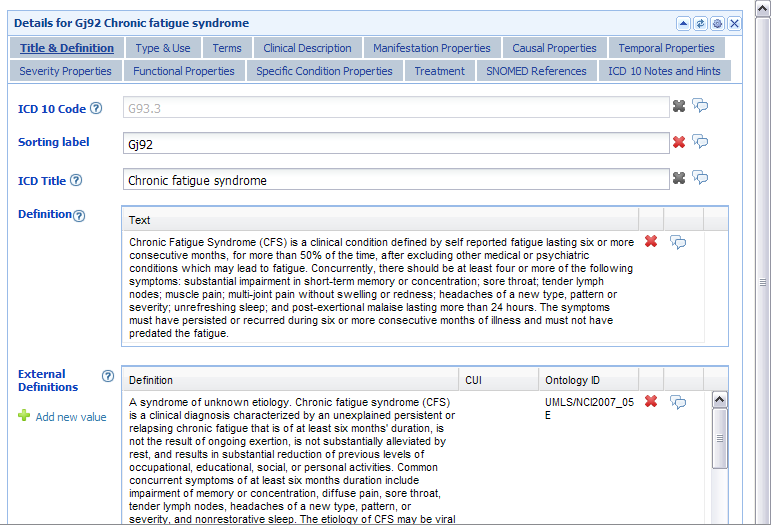 Prior to early 2013, in the public version of the ICD-11 Beta drafting platform, Chronic Fatigue Syndrome had been listed in the Foundation Component as an ICD Title entity under Diseases of the nervous system, with Benign Myalgic encephalomyelitis specified as an Inclusion term and Postviral fatigue syndrome listed under Synonyms to the Chronic Fatigue Syndrome Title entity. Therefore, all three terms were accounted for within the Beta draft; the terms were then removed from the public version of the Beta draft. 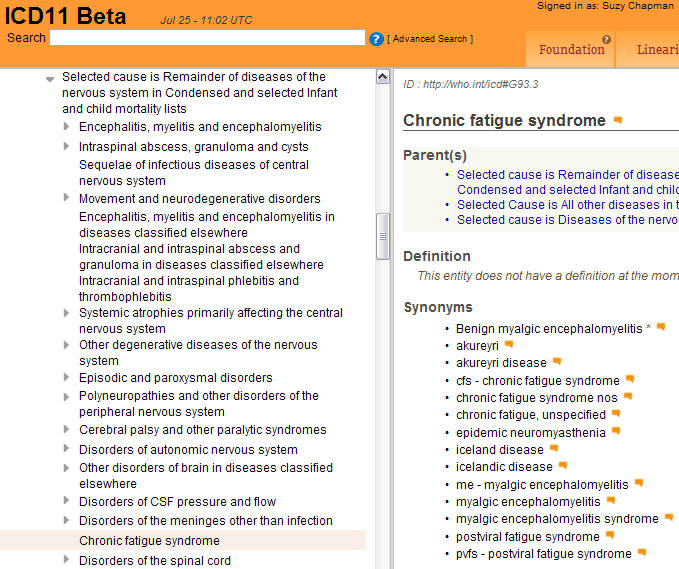 Currently, no entry for any of the terms, CFS, BME or PVFS, under any hierarchy, can be found within any chapter of ICD-11 Beta in the Foundation or the Morbidity and Mortality linearization, the top level category list, the PDF print version or the PDF Alphabetical Index. The replies that WHO Twitter admin gave to members of the public who enquired about this, stated that there was no proposal to include ME, CFS or Fybromyalgia as Mental and behavioural disorders in ICD-11. They did not say (as Parliamentary Under-Secretary of State for Health, Jane Ellison MP stated in response to a question from Annette Brooke MP) no proposal to reclassify ME/CFS in ICD-11 (¹ Hansard, House of Commons, Oral Answers to Questions, Tuesday, February 25, 2014). A member of the public also asked on Twitter if there is a proposal to reclassify ME, CFS and Fybromyalgia as “Bodily Distress Disorders” in ICD-11, but no reply was forthcoming from WHO Twitter Admin. Also, they did not confirm a proposal to retain in Chapter 07, only not to include in Chapter 05. 4. When does ICD-11 Revision intend to restore these three terms to the public version of the Beta drafting platform? We very much appreciate you taking the time to respond to our request and look forward to hearing from you. Sonya Chowdhury, CEO, Action for M.E. ; Secretariat, All Party Parliamentary Group on M.E. Annette Brook MP; Chair, All Party Parliamentary Group on M.E. Dr Charles Shepherd, Medical Adviser, ME Association; Secretariat, All Party Parliamentary Group on M.E. To clarify: the replies by WHO Twitter admin of February 12 are still displaying but some viewers may need to adjust the page setting to “All” in order for replies to be visible, as the @WHO Twitter page now defaults to “No Replies” mode. I stand by my view that responses to members of the public, via Twitter, which may be visible to some but not to others, is not an adequate substitute for the issuing of a formal statement clarifying the reason for the 12 month long absence of these three ICD-10 entities from the Beta drafting platform and ICD Revision’s intentions for their classification, or for restoring these terms to the Beta platform for public scrutiny. In her Oral Answer to the Oral Question tabled by Annette Brook MP [House of Commons, February 25, 2014] Jane Ellison, Parliamentary Under-Secretary of State for Health, refers to a WHO public statement. To the best of my knowledge, WHO has issued no recent public statement around its proposals for the classification of ME and CFS within ICD-11, other than what was stated in an unsigned tweet by an unnamed WHO admin to a member of the public, via WHO’s Twitter account, on February 12. I have asked Jane Ellison MP, Parliamentary Under-Secretary of State for Health, for the source of the WHO public statement that informed the response given to Annette Brooke MP. Since I am not a constituent, and Ms Ellison is not obliged to respond to my enquiry, I have also asked the Department of Health for clarification through a formal process for requesting information in relation to government departments and Ministers [Case ref: DE00000844965]. I will update when I have received their response (due within 18 working days of submission). 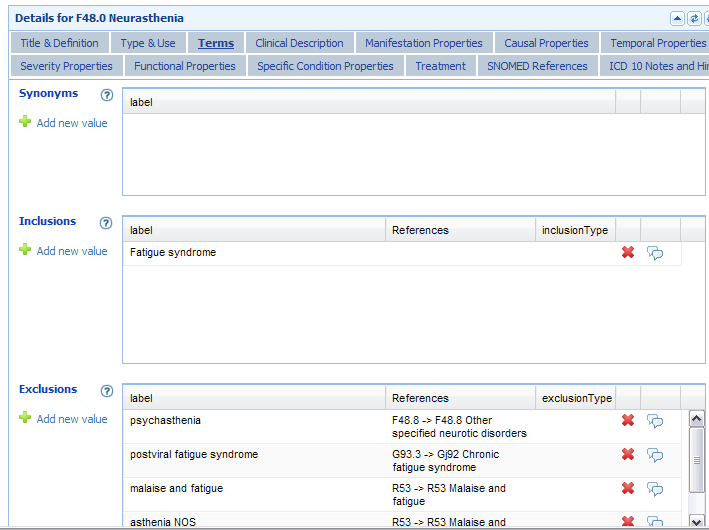 It states only that there is no proposal to include ME/CFS as Mental and behavioural disorders in ICD-11. 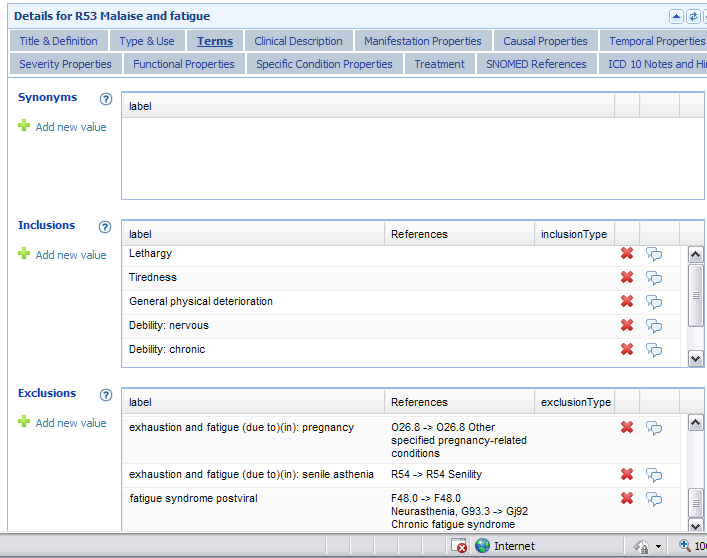 It does not confirm an intention to retain PVFS, ME and CFS within Chapter 07; it does not deny any proposal for coding under dual parent classes within the same chapter or coding to dual parent classes under more than one chapter; nor does it provide any explanation for the year long absence of these three ICD-10 terms from the ICD-11 Beta draft. It does not set out proposals for hierarchies, that is, which term(s) are proposed to be assigned ICD Title codes and given Definitions and other “Content Model” descriptors, and which are proposed to appear listed only as Inclusion terms or under Synonyms to ICD Title codes. 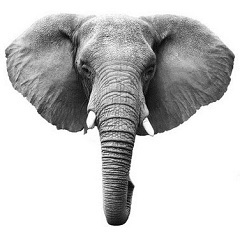 It does not clarify the proposed content of Long or Short “Content Model” Definitions. As a public statement of clarification it is neither adequate nor acceptable. I continue my quest for the issuing of a full clarification of current proposals for the G93.3 entities and for the restoration of these terms to the Beta draft. What reports he has received on the possible reclassification of ME/CFS by the World Health Organisation. The World Health Organisation is currently developing the 11th version of the international classification of diseases, which it aims to publish in 2017. No discussions have taken place between the Department and the WHO on the reclassification of ME/CFS, but the WHO has publicly stated that there is no proposal to reclassify ME/CFS in ICD-11. I thank the Minister for her answer. Many people will be greatly relieved about that. As chair of the all-party group on myalgic encephalomyelitis, I receive many representations about GPs in this country still not necessarily recognising the condition. Will she look into that, and will she work with her counterparts in the DWP on the benefits side as well? I am aware that this is a very difficult, complex and emotive area. I have heard before the point that the hon. Lady makes about GPs. I am very happy to take up her points and discuss them with her.